Might and Delight presents The Shelter Complete Edition, is the definitive package that fully realizes the trials and tribulations of the mother badger (S1) and mother lynx (S2) as they try to save their offspring from the perils of mother nature. Packed with the original Shelter, it’s sequel and expansion as well as both soundtracks for the games, it’s a heartening coming of age compilation. 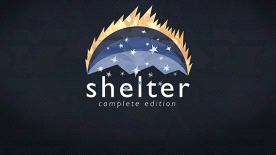 Environments in Shelter 2 are much bigger than its predecessor and allow a lot more freedom than ever before, allowing players to find favorite spots to return to. This time weather and seasons change, harsh winters and bloomy summers awaits you! The music is once again presented by Retro Family, awarded for their work on the Pid Soundtrack, and the visuals have been reinvented by adding dense atmosphere and lighting to the patterned graphical art style.